Cover detail of We Fed an Island, by José Andrés. This is FRESH AIR. I'm Terry Gross. My guest Jose Andres is both a celebrated chef and a relief worker. This year, he received the James Beard Humanitarian of the Year award for his work in Puerto Rico after Hurricane Maria. Andres and the groups he founded, World Central Kitchen and Chefs For Puerto Rico, prepared sandwiches and hot food for people throughout Puerto Rico, commandeering kitchens from restaurants, schools and an arena. The award cited his relief efforts in Puerto Rico and Haiti after the earthquake which showed, quote, "how chefs can use their expertise and unique skills to enact profound change on a global scale." In 2011, Andres received the James Beard Award for Outstanding Chef of the Year. In 2015, he received a National Humanities Medal from President Obama, which cited him for, quote, "cultivating our palates and shaping our culture," unquote, and introducing new and vibrant ingredients to our nation, whether through his innovative techniques in the kitchen, his work on clean cooking technology and access to education or the inspiration he provides to new Americans. Andres grew up in Spain and came to the U.S. after serving as a cook on a Spanish naval vessel. He became a U.S. citizen in 2013. His new book is titled "We Fed An Island: The True Story Of Rebuilding Puerto Rico One Meal At A Time." We're going to talk about his work in Puerto Rico. And later, we'll talk about the more entertaining aspects of food and some of the imaginative food innovations he's created. Jose Andres, welcome to FRESH AIR. And congratulations on all the work you've been doing. You know, when I think of chefs, I think of, like, fine dining and restaurants for people who can afford higher prices for more subtly prepared food. Why did you originally think that chefs like yourself had a place in feeding hundreds or thousands or tens of thousands of people after disasters? JOSE ANDRES: Well, every time you have a disaster, you bring the different experts into different areas for the reconstruction, for the relief process. So you need to understand that if you have to rebuild homes that you'll bring architects. If you need to take care of people in the hospitals, you bring more help with doctors. If you have to feed people, it's only very normal and logical to me that you will bring cooks. And that's what we do. Kitchens, restaurants are chaos. And chefs, restaurant people - we manage chaos very well. After a hurricane, it's a lot of chaos. And people go hungry, and people go thirsty. And what we are very good at is understanding the problem and adapting. And so a problem becomes an opportunity. That's why I think chefs more and more - you're going to be seeing more of us in these situations. We're practical. We're efficient. We can do it quicker, faster and better than anybody. GROSS: Well, let's just talk about the food aspect of it for a moment. What kind of - say, in Puerto Rico, what kind of food were you able to supply that was different from what is typically given to people who are the victims of disasters? ANDRES: Well, what happens at the very beginning is that everybody tells you everything is chaos. There is no food. It's food nowhere. We need to start bringing food from other parts. We need to start sending ships. Well, let me tell you. It was plenty of food in Puerto Rico. The private sector makes sure of that. What we had to do is organize a logical system to start activating kitchens that will have generators, that will have refrigeration, that will have gas, that will have people to work, preparing those foods. So we had to adapt. For example, sandwiches are important because you can make them quick. You can make many. You can use all the volunteers that want to help their fellow citizens. So what do we do? We bring bread from the mainland in a moment that the airport is in chaos, and the ports are collapsed? Or do we identify the bread factories who are amazing, and you help them with diesel and fuel to go back up? That's what we did. We partnered with local bakeries to make sure that those bakeries will be functioning sooner rather than later. We began getting bread. We began getting every single ham and cheese we could get our hands on - mayo. We began making sandwiches day one. So what else we had? We had rice, yes. We had chicken, yes. Let's start making rice and chicken. This is something Puerto Ricans love. It's easy to transport, gets hot very quickly. You can transport for an hour, and the food is going to arrive hot. This is the kinds of things chefs do. We adapt. So in Puerto Rico, we began getting our hands in anything we could get. And we began cooking. GROSS: So one of the things you needed to provide food for people who had none in Puerto Rico was to commandeer kitchens so that you had a place to prepare the food and cook the food. So how did you manage to find kitchens that had power supplies, too, so that you could actually prepare food? ANDRES: Well, as we landed, obviously, you already make phone calls. And even the communication was almost impossible in San Juan and around Puerto Rico. I was able through WhatsApp to communicate with friends in the island. Jose Enrique had a restaurant right in Santurce in the heart of San Juan. Jose Enrique's an amazing person and an amazing chef. And he made sure that he will have his generator up and functioning, gas to make sure that we could begin cooking. And we began getting tarps because his ceiling very much was leaking every corner. And we transform his kitchen in our first relief kitchen. We went from 1,000 meals the first day to almost 10,000 meals a day only within few days. But we saw that the operation was growing. So we had to move to a bigger one. That's why we were able to move to what they call el Coliseo, which is kind of an arena with a very big kitchen that we were able to secure. There we went from 5,000 meals the first day we move into 75,000 meals a day. But we knew that the problem was bigger because every day, we were getting more requests as the word spread out around the island that a group of cooks was providing food. We began serving hospitals because the doctors and the nurses - nobody was feeding them. And these people were working 24/7. And they had no money. And there was no either restaurants or supermarkets with food for them to eat. So we had to take care of people like doctors and nurses and others. But then we began getting phone calls from places 2, 3, 4 hours away from San Juan. So the plan was clear. The island is hungry. And with one restaurant alone, we have not enough. We need other restaurants around San Juan, other kitchens. But then we did a third one in Ponce, in the south of the island. And then we began getting this plan on the map with the help of the army engineers. What kitchens we have that are big and where we can convert into headquarters in different municipalities? And at the end, we were able to open more than 26 kitchens. And at one point, we had 18 kitchens functioning at the same time when they would reach almost 150 - over 150,000 meals a day. GROSS: You spent so much time trying to organize efforts, you know, getting, like, trucks and generators and restaurants and kitchens and figuring out what the food should be that you probably were able to spend very little time actually cooking. But there is a picture on the cover of your new book, "We Fed An Island," of you in front of this huge pot of some kind of stew maybe. And you have a spatula the size of, like, a broom that you're stirring the pot with. What's in the pot? ANDRES: On that one itself, probably, we were making a chicken rice. GROSS: In, like, a tomato base? ANDRES: All of the broth - tomato and carrots and onion and different spices. This was the rice paella operation. This was led by an amazing man called Manolo (ph) who was in Miami, a Puerto Rican and - a Spanish Puerto Rican - and came from Miami. And him alone made hundreds of thousands of paella - of rice and chicken. And yes, you're right. I was, like, going around the island, sometimes in helicopters, sometimes in little planes that we got donated or we rented, sometimes in Humvees. ANDRES: ...And there, they got you on the photo. Well, you know, I'm only as good as the people I had around me. And happens, it seems, I became the leader. But actually, we had 25,000 leaders. We had young girls - one girl called Lola that will - while his mother and father were around the island on their food truck giving food away in faraway, remote, forgotten neighborhoods, that young girl was staying behind in the headquarters leading a 1,000-people unit of sandwich makers, making sure that everybody was working hard, working fast and working efficient. Lola is 10 years old. We had leaders everywhere. If a 10-year-old can be leading hundreds of men and women in a moment of need, making sandwiches, imagine what we should be expecting from our president or from the governor or from our fellow congressmen and senators. If a young girl was able to show leadership in a moment of disrepair, what should we expect from our elected leaders? If you want to lead, lead. But you need to be leading in the good moments but especially in the moments of darkness. GROSS: So the death toll from Hurricane Maria was recently revised. It started off - like, the number that was released in December was 64, and it's just been revised. So the minimum now is considered to be just shy of 3,000, but a lot of people are saying, no, it's actually really more than that. You thought, when you were in Puerto Rico during the relief efforts, that the numbers were really underestimated, in part because of the bodies you were seeing on the street and that you knew the morgues were full. Can you describe what you were seeing that made you think these numbers are wrong - they're severely underestimating? ANDRES: Well, what I describe in the book, as you see, more often than not was just perception. But when you are in the middle of the fray, perception is good enough, sometimes. And, sure, it doesn't make you an expert. And my role was not to be counting bodies. But I was all around the island. I was bringing food to hospitals. And it's funny because I grew up in a hospital because my mom and my dad were nurses, and they had different shifts. And sometimes, the hospital was the meeting point. My dad would drop me, and my mom would take me back. So I've been going to hospitals, sometimes, for many, many years, almost daily, and I never saw a dead body. In my entire life, I think I've seen three dead bodies. All of the sudden, I'm here in a hospital. I'm here in another hospital, and here is one body. Here is another body. All of the sudden, President Trump is saying 16 bodies. And by the time he said that, myself, without even looking, I saw four. Plus, you are listening in stories - through doctors and nurses - of what, really, was going on. So only by that, without - we need to understand is not scientific but only my perception - I was like, in my entire life, I only saw three bodies, and I've been in a hospital often. And here in few days, I see four. I saw 25 percent of the death - official toll that President Trump said. Obviously, this didn't happen that way. And by somehow keeping the real number away from the public, what this did was almost not recognizing that the problem in Puerto Rico was huge, that the hurricane was amazingly big or bigger than anybody. If we knew that it was 2,000, 3,000, 4,000 death, I'm sure the weight of the federal government to support the fellow citizens of Puerto Rico would be quicker, faster. And there would build more infrastructure - money and bodies to try to help Puerto Rico to be back. That's why it was so unfair. That was a disservice to Puerto Rico and, to this day, is the reason why Puerto Rico didn't get help as quick and as effective as Puerto Rico needed. GROSS: Let me reintroduce you here. If you're just joining us, my guest is internationally known chef Jose Andres, who is also now somebody who provides and organizes food relief for disaster victims, including Hurricane Sandy, Haiti after the earthquake, Southern California after the fires last December and Puerto Rico. And his new book is about his disaster relief effort organizing chefs, commandeering school kitchens and other large kitchens and restaurant kitchens to help feed people. The book is called "We Fed An Island." We'll be right back after a break. This is FRESH AIR. GROSS: This is FRESH AIR. And if you're just joining us, my guest is internationally known chef, James Beard Award-winning chef, Jose Andres. He owns many restaurants, but there is another side of his life in which he does relief work feeding people who are the victims of disaster. And his new book, "We Fed An Island," is about helping to organize relief efforts - food relief efforts - and then feeding people in Puerto Rico after Hurricane Maria. You are a pretty famous chef. How did you start doing relief work? ANDRES: Well, Robert Egger has been my mentor for more than 25 years in just helping feed the people in need in places like Washington, D.C., and other parts in America. That has been a big learning experience for me, but I think the turning point for me was in Haiti when I arrived to Port-au-Prince a few weeks after the earthquake. And I began cooking there in different refugee camps. And I created World Central Kitchen. I think that was the moment that I saw that we need - I do believe the NGOs of the future are going to have to be more specialized. And I think World Central Kitchen - we said that we specialize in bringing smart food solutions. And what happens is that once you are on the field somewhere, and you know the landscape, and you know how a city or an island works, when a tragedy like this happens, you become very good at solving the problems. So that's why I began in beautiful Haiti. And I've never stopped. We don't go to everyone because I don't have always the time in my hands. But right now, I think World Central Kitchen - we are becoming first food responders. Obviously you said we've been in California twice with fires for many weeks. We've been in the volcano in Hawaii. We've been in the volcano in Guatemala - almost 400,000 meals. We're in Indonesia right now. We are becoming a food relief organization. And I will love sometimes to say, OK, we're not going to do this anymore. This has been a crazy year. But you know what? I have an army of cooks, an army of chefs that - they want to help their fellow Americans in times of need. So, you know, John Steinbeck said it first - wherever there is a fight so hungry people may eat, we will be there. World Central Kitchen - hopefully, in the years to come, we will be there in any emergency. GROSS: ...People are easily mobilized, chefs are easily mobilized in times of disaster, and they're ready to go and trained to do what needs to be done. ANDRES: I think we are. I think - you know, one moment I wish I was at - if - I helped my fellow Americans was after Katrina, but I didn't. And I remember specifically about the superdome. And you know what an arena is? Everybody thinks an arena is where an NBA team plays. No. No. It's a lie. An arena is a gigantic restaurant that happens - has NBA players for entertainment. So every arena potentially is a restaurant. It takes only a few hours to activate feeding facilities in the arena in case of an emergency. I never forgot about that. And I've been thinking a lot about that. That's why now, when something like this happens, I try to get my hands in the local arena. In Puerto Rico, it happened. I got an arena. I got an arena to use as a kitchen, to use as a place to gather all the food that was being donated, all the food we were buying. And there we created a crazy dream. For a few weeks, I think it became one of the biggest restaurants in the world - 75,000 meals a day. We're going to have to start thinking with the mayors, with the governors, how in moments of tragedy - hurricanes, earthquakes, tornadoes - how we need to be activating those arenas, those convention centers quicker and faster to make sure that we don't only take care of the people that are going to be taking refuge there for a few days but also using them as headquarters to distribute food all across the different areas that have been devastated by the earthquake or the hurricane. GROSS: My guest is chef and restaurateur Jose Andres. He's also a relief worker. And his new book about his efforts in Puerto Rico is called "We Fed An Island." After a break, we'll talk about being a chef and some of the more imaginative, you might even say weird experiments he's done with food. I'm Terry Gross, and this is FRESH AIR. EL GRAN COMBO: (Singing in Spanish). GROSS: This is FRESH AIR. I'm Terry Gross back with chef and relief worker Jose Andres. This year at the James Beard Awards, the Oscars of the food world, he received the Humanitarian of the Year award for his work in Puerto Rico after Hurricane Maria, organizing chefs and volunteers, commandeering kitchens and trucks, preparing as many as a hundred thousand meals a day. His new book about that is titled "We Fed An Island." He's also known for his many restaurants and for his creative food innovations. He grew up in Spain and came to the U.S. as a young man after serving in the Spanish navy as a cook. You grew up in Spain. And you started cooking with your father on open fires. Were those grills? ANDRES: No, those were some rocks in the floor. GROSS: In the floor of your home? ANDRES: No, in the middle of the mountain in an open field with a little kind of triangle - metal triangle that will elevate the paella pan. And I would gather the wood, and I would make the fire. And my father would make these big paella - these amazing rice dish that is traditional from Valencia. And we would make a big pot of food. And sometimes we were 20, and sometimes we were a hundred. My father always said that, you know, if you have the big pot, the only thing you have to do to feed more people is use - throw a few more, you know, handfuls of rice. And there you can feed anybody. And so that moment in my life was important for me. GROSS: So what did you learn about fire and cooking from those experiences? ANDRES: Well, one day I wanted to do the cooking, and my father never let me. He only put me in charge of the fire. And one day I got very upset, and he sent me away. They finished the meal. But he came, and he pulled me aside, and he told me, my son, I know you wanted to do the cooking. But I had nobody else to do the fire, and actually the fire is the most important thing. If you do control the fire, then you can do any cooking you want. This is literally for cooking, but this can be applied to life. Sometimes we all only want to do the cooking, but we forgot what is the fire. GROSS: In Spain, you left school when you were 15. Is that high school that you dropped out of? ANDRES: Yeah, but I barely made it. I mean, I barely went. GROSS: So it didn't mean much to drop out because you weren't going anyways. ANDRES: Well, I was there the first year kind of but was already this cooking school that my father thought was the right fit for me. And quite frankly, I was helping my father and my mother at home since I was very young. And I always love food and love eating and love being in the kitchen. So for me it was natural, you know? I always say, I don't work; I do what I love. I love feeding people. I love cooking. And, you know, that's my life. GROSS: So what were the dishes that became the first dishes that were your specialty? ANDRES: ...With so many different ethnic backgrounds that, you know - I would say, for example, one dish that we are very known for, especially at The Bazaar in Beverly Hills in Los Angeles, is the Philly cheesesteak. GROSS: Oh, that's ridiculous (laughter). GROSS: I'm in Philly. I'm the one who's in Philly here. GROSS: As far as possible. ANDRES: ...You know, Taliban foodies that will crush this accent - Spaniard-English tongue from touching their sacred Philly cheesesteak. But we did a hollow kind of pita bread, very light. GROSS: ...Onions - you know, whatever. ANDRES: ...The bread was long and crunchy. ANDRES: But the bread was hollow inside. It's almost like pita bread that is very thin and crunchy outside - because we overcook it. And inside is totally hollow, is empty. GROSS: So you're not filling up on the bread. ANDRES: Well, you're not filling up on the bread, but the bread is sensational because it's light. And then because it's hollow, I'm able to put a cheese mousse - we call it cheese foam that we make - which is warm. And it's unbelievable. GROSS: It's not Cheez Whiz, right? This is, like, cheese mousse (laughter). ANDRES: It's our Cheez Whiz. ANDRES: And we fill it up inside. And it's - the entire hollow bread is full of cheese. But the cheese is super light but at the same time full of flavor. And then we cut thin slices of beef. But the beef is kind of raw. It's just warming up with the help of the warmth of the cheese. And then we put an onion puree. And then sometimes we put a little bit of salt and a touch of olive oil. And then you bring that to your mouth. And it's light, almost like it doesn't weight. But then you put it, and it's like a cloud, a cloud of Philly cheesesteak. And you bite into it, and you have the flavor of the onion, the flavor of the meat, the flavor of the cheese, the crunchiness of the bread. And this is an homage to Philly. Even some people tried to crucify me back in time when I did it, but I forgive them. I'm a guy that believes that food should unite people, not break people apart. GROSS: So let me ask you. If you're relying on hot cheese to actually cook the beef, how cooked is the beef? ANDRES: No, it's rare. But, you know, you have some people that like their beef well done and some people that like their beef rare. But believe me; everybody likes our Philly cheesesteak the way we do it. It's thinly sliced, almost like it was a carpaccio. And it's just put on top of the bread. And then we use a torch but barely use to warm it up. ANDRES: Yeah, a blowtorch, a torch. And we do (imitating blowtorch). Oh, my God, I cannot wait for you to eat this. ANDRES: Your life will change forever. I mean, your life literally will change forever. One day we should go to the heart of Philly and do Philly cheesesteaks for everybody. GROSS: So what made you think that you should be redefining what a Philly cheesesteak is? ANDRES: This is great. Why a real estate millionaire guy decided to run for president? ANDRES: I mean, that's what humans - we are here for. We - this is - you know, this is not 1984. This is not, let's be - let's all be - dress the same and be the same. GROSS: No, no, I get that. I get that. GROSS: ...This could be better; I could do something different with this? ANDRES: Yes. And this is what creativity is all about is what - like, when I went to meet Dale Chihuly because I was fascinated with his work. GROSS: He does glass sculpture. ANDRES: And I did an entire menu inspiring his glass work but using sugar and isomalt to recreate his pieces. And I spent a few days with him blowing glass. I broke a tooth in the process. And I made a few pieces with Dale Chihuly as my master, as my mentor. And we did an entire menu inspiring his work. ANDRES: That's what creativity is. ANDRES: Creativity is when you sometimes do things only to bring another perspective into something. GROSS: So at the risk of making you persona non grata in Philadelphia, when you ate a Philadelphia cheesesteak in Philly, which I assume at some point you did, what was your critique of the cheesesteak? GROSS: You may never come to this city again after this, but go ahead laughter). ANDRES: I thought that the quality of the bread was so-so and I thought the quality of the meat - you know, poor meat. They - the meat didn't know who the meat was. ANDRES: They - and I thought the onion was not cooked right. And I thought the green pepper was not done well. But then these other chef, they do great Philly cheesesteak. But we're talking the vast majority. I wanted to do my homage to what has become a traditional American staple. But this is not any different than when we all have Thanksgiving and you ask people, how was your turkey and everybody - oh, it was so great. ANDRES: But you're lying. The vast majority of the turkeys are overcooked, over-dry. But what makes them unique is the people you ate them with - your family, your friends - the effort you put into making it great. That's what this all about. Sometimes we need, though, to be pushing. And a chef has always to be pushing the envelope when we talk about food. In high-end restaurants, I did it with a Philly cheesesteak. But then we all should be always pushing the envelope. That's why humanity is so great. GROSS: Well, let's take a short break here. If you're just joining us, my guest is celebrated chef Jose Andres, who owns many restaurants around the country. But he's also a food relief worker going into disaster areas and feeding people in need of food. His new book, "We Fed An Island," is about his relief efforts in Puerto Rico after Hurricane Maria. We'll be right back after a break. This is FRESH AIR. GROSS: This is FRESH AIR. And if you're just joining us, my guest is Jose Andres, a celebrated chef, a James Beard Award-winning chef who owns many restaurants but also does relief work in places like Haiti, Southern California after the fires, Sandy - after the hurricane and Puerto Rico after Hurricane Maria. His new book, "We Fed An Island," is about the relief efforts that he helped lead, supplying people with food, organizing, like, trucks and commandeering kitchens. It's called "We Fed An Island." So one of your restaurants now specializes in vegetables. Vegetables are at the center of the cuisine, not, like, a side dish. What do you love about cooking with vegetables? ANDRES: ...I don't know how to describe it - that you have to be munching for the next 25 seconds so you can ingest and put it in your stomach. Why we go through so much suffering? Why? When you cut a piece of watermelon or a piece of pineapple, you put it in your mouth, it's fresh at the very beginning. It's crunchy. It's sweet. From the first second to the last second that it's in your mouth, it's full of flavor, full of texture, full of different flowing juices around your mouth. That's worth munching. And that's worth eating. That's why vegetables - they need to be getting more respect. GROSS: Well, you're talking about fruits, not vegetables. GROSS: No kidding. Is that why? ANDRES: ...Over a hundred years ago. GROSS: So, Judge Andres, is a tomato really a fruit or a vegetable? GROSS: I'm voting for vegetable, but what's your answer? GROSS: I'm asking you for your final judgment. ANDRES: I mean, in many ways, I'm right technically, botanically - and I'm about to say this publicly, and then I'm going to start getting tweets and emails one way or the other. But technically, botanically, we could consider it without a problem a fruit. ANDRES: Are the berries a fruit? Are strawberries a fruit? Are they - so many questions are there but, yeah, technically will be a fruit in that end. But at the time, it was better to be considered a vegetable. GROSS: Do you consider tomato one of the most essential foods? Because you can eat it without being cooked, but once you cook it, you - I mean, you can use it in just about anything. You can put it on a sandwich. You can put it in an omelet. GROSS: You can make it into the base for a sauce or a stew. ANDRES: Yeah. I mean, I love tomatoes. We need to remember that obviously they came from Mexico to Europe a few centuries ago. And they found home in Spain. And the first ever written recipe was called Spanish sauce that was in an Italian cookbook. But, you know, I think tomato is highly misunderstood. Actually, it's very funny. The other day I got into my Jaleo restaurant, downtown D.C., the senator from Tennessee Lamar Alexander. And he personally brought with him tomatoes from his native state. And I was so thrilled that he brought me the tomatoes himself I responded through Twitter. So, you know, I saw tomatoes as a real way to bring politicians into the real world. And for me, it was a big surprise. But, you know, tomatoes - every book says discard the seeds. Are we kidding? The seeds are the best part of a tomato. If you go on the net and you put tomato seeds, Jose Andres or tomato seeds, Ferran Adria - I'm able to tell the tomato, tomato, are you allowing me to go inside your world? Are you able to let me go into your body and open the door and take out the beautiful crown of tomato seeds? It's the most amazing, natural gelatin in the history. And every single cookbook says discard the seeds. We should burn every single cookbook that says that. GROSS: And that's where the liquid comes from, too - isn't it? - when you're making a stew or a sauce? GROSS: Not from the seeds itself but from the pulp around it. ANDRES: Yeah. But the gelatin, the water - you know the best thing people can do at home? You can blend tomatoes at the end of the summer from any of the amazing states that produce amazing tomatoes in America. And then you put it in a coffee filter, and you wait. And what you're going to see is that the red pulp separates from the crystal-clear water that is going to be dripping in the bottom of that cup. And you're going to drink that clear tomato water with a little bit of salt and a touch of olive oil on the top. You do that, and your life again will change forever. ANDRES: At times we don't spend enough of ourselves talking to our ingredients. I talk to my ingredients, and my ingredients talk back to me. And then they tell me their secrets. Sometimes in life, in cooking, we need to take the time to listen. When you listen, you learn. When you learn, fascinating things happen. GROSS: Let me reintroduce you here. If you're just joining us, my guest is internationally known chef Jose Andres, who is also now somebody who provides and organizes food relief for disaster victims. And his new book, "We Fed An Island," is about helping to organize food relief efforts and then feeding people in Puerto Rico after Hurricane Maria. We'll be right back after a break. This is FRESH AIR. (SOUNDBITE OF ALFREDO RODRIGUEZ'S "VIENTE ANOS (TWENTY YEARS)"
GROSS: This is FRESH AIR. And if you're just joining us, my guest is internationally known chef, James Beard Award-winning chef Jose Andres. He owns many restaurants. But there is another side of his life in which he does relief work feeding people who are the victims of disaster. And his new book, "We Fed An Island," is about helping to organize relief efforts, food relief efforts and then feeding people in Puerto Rico after Hurricane Maria. One of the things that you do is molecular gastronomy, which is basically using scientific knowledge about food, understanding its chemical makeup to make interesting tastes and dishes. So can you give us an example of something unusual that you've done because of your knowledge of the makeup of food that's, like, really tasty and a little weird? ANDRES: Listen; we hate the name molecular gastronomy. GROSS: Oh, it sounds too laboratory (laughter). GROSS: A mad scientist in the lab. ANDRES: Because almost it's like people finger point at us in the old days. Oh, he's a molecular chef. Listen to me, people of America. Everything is molecular. When you drink wine, that's molecular. When you drink beer, that's molecular. When eat cheese, that's molecular. When your food gets rotten, that's molecular. Your pickles - that's molecular. Everything is molecular. What has happened is that before we were clueless. We didn't knew why things happen. We didn't know about Maillard reaction. We didn't know about my mayonnaise emulsion, a stable emulsion. Now we know. Now chefs like me - we created a class next to professors of physics at the Harvard which became one of the most popular undergrad classes at Harvard. Now we have knowledge. And knowledge makes you powerful. And thanks to the power, we are able to do, for example, mousse that in the old days you will require heavy cream and meat fat. And now I can make the same mousse without any dairy, without any heavy cream and only using the pure ingredient like strawberries. We can make a mousse of a strawberry without the use of any butter or any fat. That's knowledge. That's what gives you the power to do better food, more tasty food. And that's the way forward. More knowledge in the hands of chefs and the people will help us to be feeding the world better every day. GROSS: But what's an example of something that you've done that's unusual because of your knowledge of the makeup of the food you were working with? ANDRES: Well, for example, I'm going to tell you something. Like, just my team came up over the last few weeks and just they were showing me all the results. ANDRES: We bought the machine that we have in our Think Food Tank, our laboratory. It needs freeze-drying machine. We began learning about freeze-dry foods for the astronauts and things like this. And freeze-dry is great because it brings any food down to a very cold, freezing temperature. And in the process, you are extracting the humidity of that food that you are trying to freeze-dry. Are you with me? So we got condensed milk. And we - pure condensed milk, the same condensed milk you can buy anywhere in a can - and we put it inside the machine. We put a dollop of only, only the condensed milk. But we never did it before, so we didn't know how - what was going to happen. In life, you have to be not afraid of failure to have successes. So we put it. And what happened is that it has so much sugar and the freeze-drying and kind of the pressure that, all of the sudden, instead of the dollop of condensed milk becoming smaller, it began growing and growing. And at the end, we have, like, a big balloon like a thin skin of condensed milk, hollow inside, crunchy in the outside. And all of the sudden, we have a new thing. What are we going to do with that? I don't know, but we already created something like was not created before. We have, like, a condensed milk crispy, crunchy balloon. GROSS: Does it taste good? ANDRES: ...Condensed milk game. I'm telling you - we have a condensed milk game now. ANDRES: So this is one of the things, you know? But remember this is not strange. We are only using technologies. It's not any different than frying. It's not any different than steaming. It's not any different than roasting. It's only one more technique. And having knowledge of techniques allows you to do more things. I guarantee you we're going to see more of those things in the years to come, and the good things will remain. And I know the things will only stay in the very high-end restaurants, but I love that new thing with condensed milk and other things. We were able to do, with the same technique, soy sauce with little bit of gelatin - and at the end, becomes like a pork rind, like a fried pork rind. ANDRES: If I put the pork rinds next to this new soy, you don't know which one is which. That's how amazing this is. But how we did it? Because we were not afraid of failure. The worst thing you can do in life is being afraid of failure. And that's what happened in Puerto Rico. We had too many people afraid of failure, afraid of breaking the rules. You can never be afraid of breaking the rules if you can be improving something. GROSS: Jose Andres, thank you so much for talking with us. It's really been a pleasure. ANDRES: Thank you for having me. 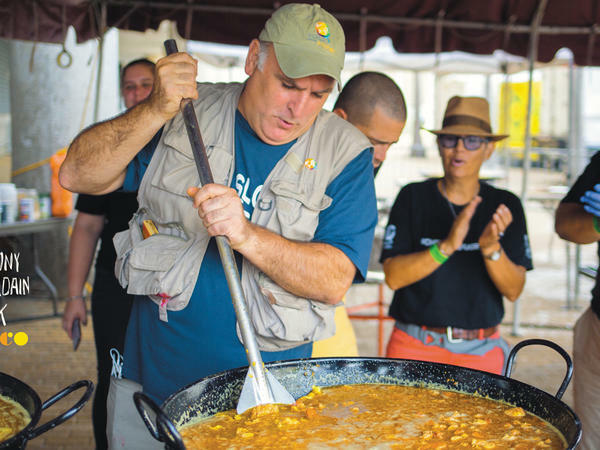 GROSS: Jose Andres has a new book called "We Fed An Island" about his relief efforts in Puerto Rico after Hurricane Maria. Tomorrow on FRESH AIR, my guest will be Bob Woodward. In his new book, "Fear: Trump In The White House," he writes, quote, "the reality was that the U.S. in 2017 was tethered to the words and actions of an emotionally overwrought, mercurial and unpredictable leader. Members of his staff had joined to purposefully block what they believed were the president's most dangerous impulses." I hope you'll join us. FRESH AIR's executive producer is Danny Miller. Our senior producer is Roberta Shorrock. Our technical director and engineer is Audrey Bentham. Our associate producer of digital media is Molly Seavy-Nesper. Thea Chaloner directed today's show. I'm Terry Gross. (SOUNDBITE OF DAVE HOLLAND AND PEPE HABICHUELA'S "JOYRIDE") Transcript provided by NPR, Copyright NPR.